Evolution is change over time, and it is well-accepted that cancers evolve through the stepwise accumulation of somatic mutations. Logically, mutations ‘cause’ cancer, and therefore, simplistically, the key to preventing cancer could be to avoid mutations. However, epithelium, like the skin and intestines, divide and shed millions of cells every day, and could accumulate many mutations because DNA replication is imperfect. One potential safeguard against ‘replication’ errors is a stem cell hierarchy, where long-lived stem cells divide infrequently. However, studies in mice indicate that both skin1 and intestinal stem cells2 are not quiescent but rather are actively dividing. Such tissues are primed for evolution because many more cells are produced than can survive. One direct way to determine whether normal cells accumulate mutations is to sequence their genomes. Detecting mutations in normal tissues is difficult because they are polyclonal. Each normal cell could have thousands of mutations, but because they differ between cells, the frequencies of specific mutations are too low to detect by conventional DNA sequencing. By sequencing individual subclones, either by subdividing normal skin into very small portions3 or by culturing individual intestinal crypt subclones4, new studies indicate that normal somatic cell genomes mutate almost as fast as cancer cell genomes (Table 1). In skin the dominant mutation signature is caused by ultraviolet light, and in the intestines it appears to be aging or replication errors that result in the mutation signature. Hence, normal and cancer cell lineages appear to acquire most of their mutations by the same processes (Table 1). Of particular interest are comparisons between the small intestines and the colon4 because colorectal cancer is very common and small intestine cancer is about 100 times less common even though the small intestine is longer (30 feet versus 6 feet for the colon); in mice, both colon and small intestine stem cells are mitotic2. Their microenvironments are strikingly different, with the small intestine virtually sterile and the colon filled with a rich microbiome. Yet there were no appreciable differences in mutation frequencies or spectra between the small intestine and the colon (Table 1). Mutations cause cancer, but the small intestine somehow manages to avoid cancer despite accumulating the same number of replication errors as the colon. What might be going on? Evolution is not just propelled by mutation because two other major evolutionary forces (drift and selection) determine whether or not a cell survives. Intestinal crypts have a highly localised micro-environmental region which regulates cellular dynamics. They contain multiple stem cells that normally divide and turn over by a niche mechanism (Figure 1). A key point is that every new mutation has a period of uncertainty because its fate depends on the fate of its stem cell lineage – every new stem cell mutation is eventually lost or forever fixed (present in all crypt cells). For example, a neutral or passenger mutation is randomly fixed or lost through drift. Most new mutations are lost because the odds of random fixation are 1/N (N = stem cell population size). Figure 1: Interactions of the three major parameters of evolution (mutation (M), drift (D), and selection (S)) within intestinal crypt stem cell niches. Crypts contain small numbers of mitotic stem cells at their bases that produce differentiated progeny that migrate upwards and die. Stem cells may divide asymmetrically or symmetrically, and eventually all present-day stem cell lineages are lost except one. Therefore, most new mutations are lost and a minority of mutations are fixed. Colon crypts are larger than SI crypts. Because selection is less efficient in smaller populations7, relatively fewer driver mutations may accumulate in the SI than the colon (this concept is explained in a YouTube video). Hence, intrinsic tissue architectural difference may account for why colon and SI stem cells acquire similar numbers of mutations with aging, but colon cancer is common and SI cancer is rare. The size scale is the same for the colon and SI images. By contrast, most driver mutations could be fixed whenever they arise if they confer a selective survival advantage over neighbouring crypt stem cells. Such preferential fixation of driver mutations would increase the risks for progression to cancer. But what if it were possible to minimise selection and maximise drift? 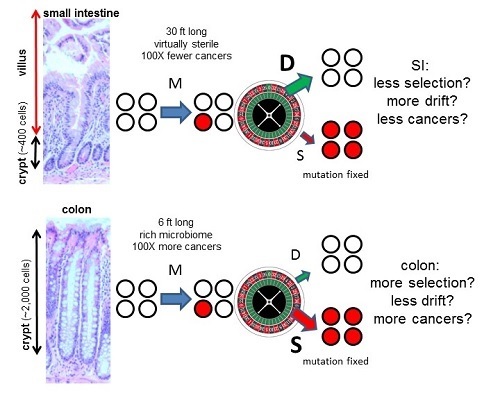 In this case, driver mutations would be fixed no more often than passenger mutations, which would reduce cancer risks and could potentially explain how the small intestine can accumulate similar numbers of mutations as the colon but have significantly lower cancer risks (Figure 1). It is commonly assumed that selection overwhelms drift. However, selection and drift depend on interactions between neighbouring cells, and small intestine and colon crypt neighbourhoods differ. An architectural difference is that small intestine crypts are smaller than colon crypts (~400 versus ~2,000 cells). Population genetics theory indicates that selection efficiency depends on the numbers of competing individuals7. Selection is efficient in large populations, but as populations diminish in size, drift become increasingly more important than selection in determining survival. It may be possible to exploit ‘randomness’ as an anti-cancer mechanism because in very small stem cell populations there may be less preferential fixation of drivers. Experimentally, sporadic stem cell mutations in even canonical drivers (Apc, Kras, Tp53) are frequently lost from crypts8. If small intestine crypt stem cell populations are smaller than in the colon, drift will be stronger (Figure 1), thereby reducing driver mutation accumulation and cancer risks even though net mutation accumulation is unchanged. Mitotic stem cells and random replication errors provide a mechanism where age or total numbers of stem cell divisions (‘bad luck’9) correlates with increased cancer risks. Mutations per se do not cause cancer, but the likelihood of one cell accumulating the right combination of driver mutations increases with the large number of mutations that normally accumulate with ageing. However, the two other forces of evolution (selection and drift) add an element of ‘skill’ such that the same numbers of mutations in the small intestine lead to far fewer cancers than in the colon. For this strategy to work, bona fide driver mutations must be exceedingly rare, which seems likely because colorectal cancer is still very rare relative to all the mutations that accumulate in normal crypts. Evidence to support a greater role of drift in protecting the small intestine from cancer would be higher frequencies of deleterious mutations and lower frequencies of driver mutations. Although one cannot convert a colon into a small intestine, stem cell numbers per crypt could be altered because stemness depends on signalling from the surrounding mesenchymal niche10. Environmental manipulations that reduce cancer risks could work by minimising stem cell niche sizes. Most of us have ~100 protein truncating germline mutations11, illustrating that mammalian genomes are robust to variation, rationalising why so many somatic mutations can accumulate throughout life without visible evolution. Mutations cause cancer, but the vast majority of mutations do not change the phenotype. The neutrality or near neutrality of most mutations can help explain why many colorectal tumours, despite extensive number of subclonal mutations, appear to be single ‘Big Bang’ expansions12. Evolution entails competition between neighbouring cells, and the exact subdivision of cells into small replicative units may be an elementary reason for why certain tissues are more tumour prone. Although mutations may be inevitable with ageing, the small intestine can provide mechanistic hints of ways the other major forces of evolution (drift and selection) are manipulated to prevent cancers. Clayton E, Doupé DP, Klein AM, Winton DJ, Simons BD, Jones PH (2007) A single type of progenitor cell maintains normal epidermis. Nature. 446:185-9. Barker N, et al (2007) Identification of stem cells in small intestine and colon by marker gene Lgr5. Nature 449:1003-1007. Martincorena I, Roshan A, Gerstung M, Ellis P, Van Loo P, McLaren S, Wedge DC, Fullam A, Alexandrov LB, Tubio JM, Stebbings L (2015) High burden and pervasive positive selection of somatic mutations in normal human skin. Science 348:880-6. Blokzijl F, de Ligt J, Jager M, et al (2016) Tissue-specific mutation accumulation in human adult stem cells during life. Nature 538:260-264. Lopez-Garcia C, Klein AM, Simons BD, & Winton DJ (2010) Intestinal stem cell replacement follows a pattern of neutral drift. Science 330:822-825. Snippert HJ, et al (2010) Intestinal crypt homeostasis results from neutral competition between symmetrically dividing Lgr5 stem cells. Cell 143:134-144. Whitlock MC (2000) Fixation of new alleles and the extinction of small populations: drift load, beneficial alleles, and sexual selection. Evolution; international journal of organic evolution 546:1855-1861. Vermeulen L, et al (2013) Defining stem cell dynamics in models of intestinal tumor initiation. Science 342:995-998. Tomasetti C, Vogelstein B (2015) Cancer etiology. Variation in cancer risk among tissues can be explained by the number of stem cell divisions. Science 347:78-81. Clevers H, Loh KM, Nusse R (2014) Stem cell signaling. An integral program for tissue renewal and regeneration: Wnt signaling and stem cell control. Science 346:1248012. Lek M, et al (2016) Analysis of protein-coding genetic variation in 60,706 humans. Nature 536:285-91. Sottoriva A, Kang H, Ma Z, Graham TA, Salomon MP, Zhao J, Marjoram P, Siegmund K, Press MF, Shibata D, Curtis C (2015) A Big Bang model of human colorectal tumor growth. Nat Genet. 47:209-16. I just read your Do Mutations Cause Cancer blog. I like your discussion of the relative roles of drift in different tissues. This raises the question – are stem cell populations of different sizes for colon and small intestines? I know that it’s small for colon (10-20 cells), but I don’t know how well this is known. Finally, while it’s true that “it is well-accepted that cancers evolve through the stepwise accumulation of somatic mutations”, I do not accept this at all (see https://www.ncbi.nlm.nih.gov/pubmed/28754675 ). I hope to see you at the December meeting in Arizona. Enjoyed your nice “in press” perspective in Cancer Research! Amazing how little we know despite all the research on what “causes” cancer. I think many people assume “mutations cause cancer” and it’s a lot more complicated. Mutations are necessary but not sufficient, so what else is also needed? A clue in the intestines is that the mutation spectra are identical between the SI and colon. This implies that mutation mechanisms are similar, and the dominant signature is DNA replication (or aging). So the same signature (mechanism), the same number of mutations, but the SI is virtually immune to cancer whereas CRC is the second most common type of human cancer. My blog gives a potential answer where selection could be less efficient in the small intestines if there were fewer stem cells per crypt. The data for human crypts are unknown, but small intestinal crypts are much smaller than colon crypts. An advantage of using stem cell niche size to modulate the efficiency of selection is that this mechanism is built in (ie due to structural design) and is 1) inherently reliable, 2) could prevent the accumulation of driver mutations, 3) allows for the mutation mechanism to be similar in the colon and SI. Still much to understand on how mutations and their immediate microenvironments interact. Thanks! I totally agree that cell population sizes will influence the impact of selection vs drift. Your blog makes good points, and I particularly agree with your point below that mutational mechanisms appear similar for diverse tissues (roughly 2000-3000 mutations per stem cell, from hematopoietic to colon) despite big differences in cancer risk. Something needs explaining! I think that microenvironmental changes (due to aging, or other factors like obesity or chronic inflammation like with IBS) will be a dominant force. Note that CML, AML and colon cancer have very similar age incidence curves, despite very different stem cell pool sizes and different #s of required mutations (1 for CML, and multiple for AML and likely even more for colon cancer). See http://www.pnas.org/content/112/29/8914.long . So I would argue that the common incidence curve (most cases after 50 years of age) reflects a common non-cell intrinsic factor – the changing microenvironment with age. We go downhill…. I believe that a major impact of stem cell population size will be on the classes of mutations found, in that mutations that have more minor impacts on cell fitness could be fixed by chance alone in small stem cell pools like in the intestines (and even mutations, like in MMR factors, that would be expected to reduce stem cell fitness). I think your ideas on comparing small intestine and large intestine stem cell pool sizes, and how this will influence mutation fixation, are excellent. Do model this! I like (but don’t enjoy) the statement, “We go downhill….” An evolutionary ladder of tumor progression implies increasing fitness with time, but alas the usual outcome of somatic cell evolution is aging and decreasing fitness. Your PNAS paper calculates a likelihood of “cancer”. Given that normal intestinal and tumor cells accumulate many mutations with aging, do you think aging and cancer are both sides of the same evolutionary mechanism or “game”? (Perhaps like a lottery (i.e. Powerball) where most players (cells) are “losers” with one very rare “winner”). James DeGregori is right about mutations doing little or nothing in the absence of the appropriate selective pressures, i.e. they are essentially adaptive (see Cancer Discovery, 2015, 5: 806-820 for discussion on this important point). Some genomics scientists still ignore that cancer evolves in an ecosystem context, despite what Bob Gatenby, Carlo Maley, I and others have been saying for some years now. Weird. I think James’ main and novel point is his suggestion that our tissue ecosystems degrade with age (and with chronic cancerous exposures) and that this provides the context for the age-associated increase we see in most common cancers. But there are still observations that don’t really fit. How come, for example, cancer rates actually decline after 80 years of age (Harding C et al, Cancer Res, 2008, 68(11): 4465-4478)? Led by Prof. Mel Greaves and brought to you by the British Journal of Cancer, this blog provides a forum for the discussion of how an evolutionary perspective is changing thinking about cancer. Which Cancers are Most Survivable and Why? The views expressed on this blog represent those of the individuals only and do not represent the views of British Journal of Cancer or Cancer Research UK.